We are very proud of our school and its history. 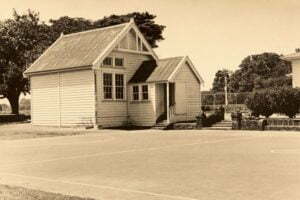 Three Kings began as Mt Roskill School in 1878. Our school is the oldest school in Auckland on its original site, and in 2018 we’ll be celebrating our 140th Jubilee. The school is situated within a volcanic crater. A feature of the school is that the walls and steps were built during the Depression using the volcanic rocks that are strewn around that area. Our school is part of the Three Kings Heritage Trail, created by the Puketāpapa Local Board to recognise local sites of heritage and cultural significance. We are #11 on the Heritage Trail. Hard to believe that the school started out as a large single classroom with a fireplace and entrance porch, housing 44 students! Some of our students participated in a school history project back in 2008 – you can view their work on the Living Heritage website. Here’s some additional information about the school’s history through until the 1970s. We are working with a historian to bring this up to date. We also have a record of school principals.